The Believe It Mind Shift programme is for individuals who want to challenge their self-limiting beliefs in order to achieve their goals and aspirations. I will teach you how to prioritise and breakdown your goals into manageable steps using a tailored action plan, so you can confidently work towards achieving your personal potential. I have first-hand experience of the common pitfalls and challenges you face when making a major change or transition in life, so I can offer real support and know-how. We will work together to remove any obstacles stopping you from achieving your goals. How will you know if this package is right for you? invest the time and resources required to follow your dreams and aspirations. work with a coach that will give you encouragement and help you to define, clarify and create a clear plan of action. work with an intuitive coach who can act as a sounding board to listen and support you objectively as you move forward. make a commitment to change your old habits and develop new positive ones. take ownership of anchoring your future success. What can you expect after the programme? 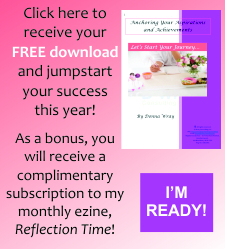 feel empowered to make changes in your personal or professional life. transform your mindset armed with strategies and processes you need to move forward. have a clear, concise action plan for short and long-term goals. be able to recognise recurring themes and patterns in your career(s) and be able to discover new approaches to remove blocks to progress. have better work-life balance and have redefined “success” for yourself. understand your key strengths to tap into your full potential. 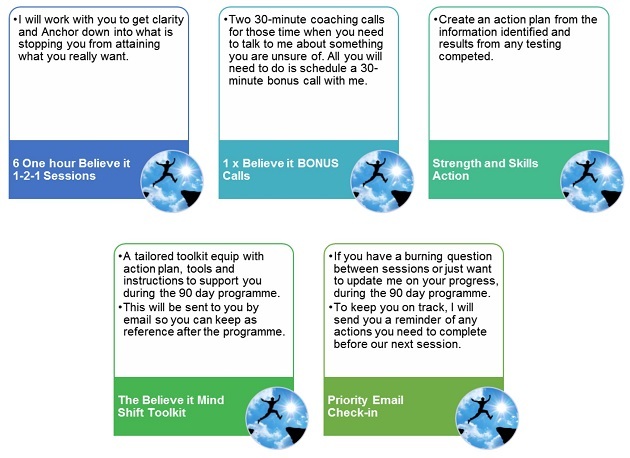 So how do I join the 60-Day Believe It Mind Shift Programme? Send an email to me at donna@dwrayconsulting.com to schedule your complimentary Believe It Coaching Clarity Call with me and we’ll take it from there! Thank you for taking the time to sign up for your D Wray Consulting complimentary Believe It Coaching Clarity Call. If you believe it, you can achieve it! !